Pit Stop - Inland Valley Humane Society and S.P.C.A. You Can't Buy Love. But You Can Adopt It. Welcome to the Inland Valley Humane Society Humane Society & S.P.C.A's Adoption Photo Gallery. Just click on a photo to see more details about any animal in the gallery. Because animals are adopted every day the one you may be interested in, may or may not be available when you visit the shelter, so please keep that in mind. This gallery is updated on a daily basis in order to keep it current with new arrivals. Make a gift to help the homeless animals. Pets like Sammy need our help to feel better so they can find their forever home! 12 year old Sammy was dumped on the side of the road, unable to walk, see or eat. She was left to suffer for months. Luckily for Sammy, IVHS was there to help. Our veterinarians immediately began to treat Sammy, removing her dirty matted fur. After a month in our care, we were able to find Sammy a family that would provide her with a loving forever home. Every dollar counts! In the state of California, every dog that is over the age of 4 months must be vaccinated against rabies and have a current license. The Inland Valley Humane Society & S.P.C.A. monitors the licensing/rabies control program for residents living in the contracted cities. Less than 1% of the animals that are rescued from the streets and temporarily placed into an animal shelter have some form of I.D. on them. License your pet online by choosing your city from the right. The Inland Valley Humane Society & SPCA provides animal control services to the cities of Chino, Chino Hills, Claremont, Diamond Bar, Glendora, La Verne, Montclair, Ontario, Pomona, San Dimas and the unincorporated areas of San Bernardino County including West End, San Antonio Heights and Mt. Baldy. A $40 spay and neuter program for Pit Bulls and Pit Bull mixed breeds. Thanks to a generous gift from the late Dierk D Peters of Duke Pacific, we are proud to provide this service to our communities. This program is open to all residents currently within the organization’s service area. We provide animal care and control services to the cities of Chino, Chino Hills, Claremont, Diamond Bar, Glendora, La Verne, Montclair, Ontario, Pomona, San Dimas and the unincorporated areas of San Bernardino County including West End, San Antonio Heights and Mt. Baldy. Age and weight restrictions apply. This program is intended to help curb the amount of Pit Bulls and Pit Bull puppies entering the shelter every year. All participants must be licensed or have applied for a license for their pet. Space is limited and is subject to a first come first serve basis. Call 909-623-9777 ext 669 for more information. Come to our vet services department at the shelter. You will need to bring your dog or a photo of your dog to confirm the breed. Fill out the paperwork and pay $40 which is non-refundable. Spay & neuter appointments must be made in person Monday – Friday from the hours of 9:00 AM – 12:00 PM only. Once you have made your appointment you will be given your drop off instructions. In addition to these clinics, the Inland Valley Humane Society offers low cost spay and neuter appointments for dogs on a daily basis at very reasonable rates. Every year the Inland Valley Humane Society & SPCA spays and neuters thousands of animals in an effort to better control the pet overpopulation problem. For more information please call (909) 623-9777, ext. 669. 1. Exercise your dog every day. By exercising your Pit Bull for just 15 minutes a day you can help release some of their pent up energy that could otherwise lead to behavior problems. 2. Don’t leave your Pit Bull alone with any other animals. Although your dog might appear to be well behaved among other animals, Pit Bulls are known for animal aggression. 3. Watch your dog around small children. Small children have a tendency to irritate pets more so than adults, so be sure to carefully watch children around your Pit Bull. 4. Always have your dog on a leash. Obey leash laws and keep your pet secure in public places at all times. 5. Supervise your dog and don’t allow them to roam freely. Even though your Pit Bull may be obedient something small could set them off, which could result in them getting lost or even getting hit by a car. 6. Spay or Neuter your pet. Many undesirable behaviors, such as urine-marking or aggression, can be curbed by getting your pet spayed or neutered. 7. Train your Pit Bull. 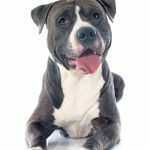 It’s extremely important for Pit Bull owners to know how to control their dog, and with obedience training both the owner and pet can gain useful knowledge. 8. Avoid dog parks. Consider taking your Pit Bull to dog socialization classes instead where they can get to know other animals in a safe, secure environment. 9. Socialize your dog. By socializing your dog you are exposing it to a wide array of people and animals, which allows the dog to feel comfortable and safe in many different situations. 10. Keep your dog safely confined. Pit Bulls are often the most frequent breed at animal shelters due to their ability to jump high and escape from backyards, so consider putting in a fence that’s at least 6 feet tall. Monday – Saturday: 8:00 A.M. – 5:30 P.M.
Monday – Saturday: 10:00 A.M. – 5:30 P.M.
© 2019 Inland Valley Humane Society and S.P.C.A.